This popular annual event is a unique opportunity to explore the essence of heirloom apples. Supermarkets today provide only a limited sample of the thousands of apple varieties once available to 19th-century fruit lovers. Monticello fruit gardeners will provide numerous apple varieties and discuss their history and culture. Participants will taste, savor and rate each apple in this two-and-a-half-hour program. 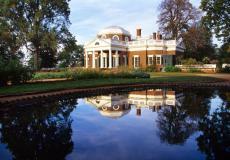 A free Fall Open House at our Thomas Jefferson Center for Historic Plants will follow the tasting.